On arrival at the Regent Theatre for the 20th Anniversary of iD Dunedin Fashion Week the atmosphere was buzzing. But conversations quickly turned to the horrific news of the mass shootings at two Christchurch mosques on Friday 15 March, only hours before the iD show was due to take place. Despite other events being cancelled around New Zealand iD Fashion Week pushed on with the show, receiving some backlash on social media. Opening night at iD Dunedin Fashion Week 2019. Photo credit: Chris Sullivan. iD Fashion Week is only made possible with the support of hundreds of volunteers who work behind the scenes. And for the past two decades, Dunedin has rallied around the event in support of its designer community, sponsoring numerous prizes for the iD International Emerging Designer Awards. Many of the finalists also traveled from other parts of the world and this year came from as far afield as Hungary, Japan, China, U.S, U.K, Argentina and Australia - all at their own expense - to put their collections on an international stage. But it was difficult not to be distracted by the magnitude of the breaking news, and those on opening night at the Regent Theatre - a new location for the iD event - were checking their phones for updates of the rising death toll before the show kicked off 20-minutes after the official start time. The evening’s host gave an overly-long introduction that lacked the command, pace and presence of previous iD MC’s. She talked of the night’s proceedings before mentioning the ‘the awful’ event that had taken place in Christchurch. Had she addressed the elephant in the room right at the outset the audience might have felt they were in more capable hands. Stolen Girlfriends Club show their current collection in celebration of 20 years of iD. Photo: Chris Sullivan. The top of the show was all about celebrating New Zealand designers and showcasing the latest offerings. The Dunedin labels included Mild Red, Charmaine Reveley, Dada, Nom *D, Company of Strangers, and Carlson who presented a collection using fabric from the labels’ archive. Other Kiwi favourites were Zambesi, Kate Sylvester, Stolen Girlfriends Club, WORLD Man with some glammed up suiting, luxury womenswear label Wynn Hamlyn, Hailwood, Ruby, and Liam. But as always, the night belongs to the emerging designers. This year, some of finalists were unable to present their collections due to Visa issues, which left 27 of the original 33 designers competing for prizes. Minori Yanagase (Osaka Bunka Institute of Fashion) presents her collection on judging day. photo credit: Chris Sullivan. What makes the emerging designer show so compelling is witnessing a unique approach to aesthetic. Not only do each of the designers pour countless hours into their collections paying close attention to theme and visual concept, but also fabrication. Many of the designers use new technology to create their fabrics, as well as experimenting with sustainable approaches. Hand-crafted techniques have also been making a comeback over the years, and this year was no exception. This year there were shared themes across many of the collections: from the impact of social media to an exploration of identity, along with collections based on very personal stories and experiences. But it is often the unexpected collections that are the most memorable and make a lasting impact. Bethany Caldwell sent her novel characters on stage with a serious message behind her collection. Photo: Chris Sullivan. While the message behind Australian designer Bethany Caldwell took the Beca Sustainability Award for her ‘Waste Age’ collection. Caldwell drew on consumers becoming engulfed by their own excess waste, transformed into bizarre creatures/ monsters, which provided the entertainment factor for the night. Australian designer, Betty Liu (second place winner) sent a larger than life representation of a paper lantern onto the stage, with her model awkwardly manouvreing their way carefully back up the runway sending some chuckles around the auditorium. Her collection looked at the commodification of Chinese culture - the traditional qipao (cheongsam dress) provided the basis of her collection and she presented cheongsam sewn together in a series of connecting dresses (much like a paper doll). This represented the mass production of the traditional dress, which is sold to tourists. Betty Liu won second place with a collection exploring the commodification of Chinese culture. Photo: Chris Sullivan. Many of designers had pieces in their collections that could easily be adapted for the retail environment such as George Clarke’s menswear consisting of street-ready denim, while Japanese designer Minori Yanagase showcased quirky vibrant prints in a unisex streetwear collection inspired by the impact of social media. Dayun Lee a Korean designer (London College of Fashion) created her collection from wool and took inspiration from 1940s military uniforms (pictured right) integrating circular shapes within her garments. While U.K designer, Amy Louise Redford, (Manchester Fashion Institute) researched Maori tattoo resulting in a refined womenswear collection, beautifully detailed with ostrich feathers and repeating woven patterns (pictured above left). Rebecca Carrington’s collection backstage. Photo: Chris Sullivan. 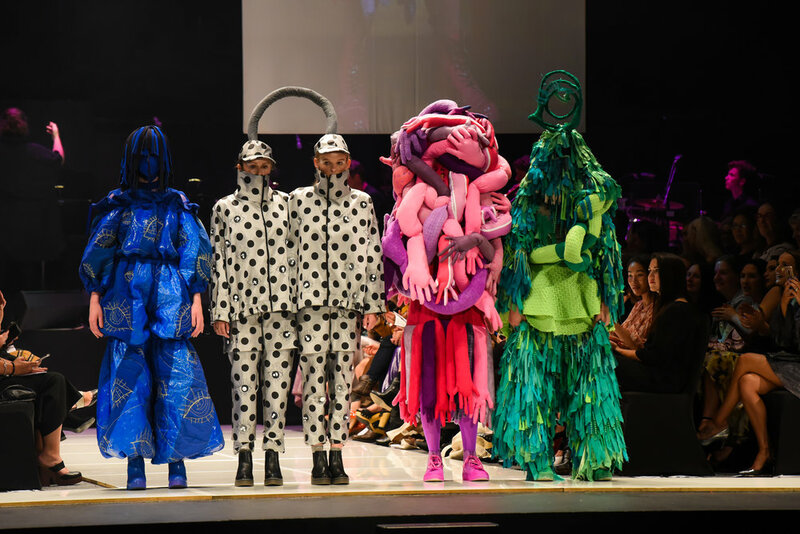 Rebecca Carrington from Manchester Metropolitan University won the coveted: H&J Smith iD International Emerging Designer, taking home a prize of NZ 6,000. dollars. Carrington’s collection, ‘The Story of Miss Ruby Ribbon’ is a celebration of her childhood and her deceased pet parrot, Ruby. Carrington created a fictional narrative telling the tale of a 21-year-old woman who still enjoys playing with toys. The U.K designer used toys as shapes for her garments, scaling them up from A3 drawings to create larger versions for pattern pieces. This year’s judges were Tanya Carlson, Benny Castles (WORLD), Margi Robertson (NOM*d), Kate Sylvester and VIVA editor Amanda Linnell, while previously, international judges have taken part in the deliberations. Benny Castles said Carrington’s designs were “uplifting and inspiring” at a time of global negativity. Last year the event was held at the Dunedin Town Hall, offering a fair amount of visibility for the audience regardless of seating. And prior to this, The Dunedin Railway Station has provided an element of spectacle, giving viewers an up-close-and-personal view of the garments, making it an event not to be missed. But this year, The Regent Theatre, albeit, central and accessible proved not be an ideal space for a runway show. With some awkward staging and lighting, collections made their way from the theatre stage down into the stalls seating area and upstairs to the upper circle. Once the models arrived upstairs a glaring bright light illuminated the circle from the back of the theatre. For anyone seated in the front half of the circle the additional lighting and staging provided nothing but a distraction, with only those in the upper back circle able to see the garments. On the opening night, many seats were left unfilled. This may have been due to the breaking news in Christchurch, or possibly the change of venue. Carlson garments celebrate 20 years of iD Dunedin Fashion Week. Image Chris Sullivan. One particular highlight of the night was a presentation of garments by designer Tanya Carlson, whose work featured on stage with beautiful lighting, and a multimedia projection featuring dancers from the Royal New Zealand Ballet. All in all, the show is and always will be a celebration of new and local talent. And despite the unfortunate set of circumstances iD Fashion week did a great job of pulling through - as much for the international designers who had traveled so far for the occasion - but also showing community spirit, which has been to Dunedin’s credit.